What is the pipe bending and how to apply? Pipe bending is a reshaping process applied to a straight pipe to obtain any given angle and radius. You wiil find information about the use of tools and machinery and also various bending methods in this section. Pipe bending techniques are used on production of goods made with pipe and special tubes for different types of applications and pipelines. In recent years, it is easier to obtain excellent quality and sophisticated bending thanks to the development of pipe bending techonology, precise controls, servo drivers and power units. In production, the importance of tube bends increases day by day. Nowadays, to weld combine with grinding (stoning)take great time and is regarded as a heavy labor. This technique previously was considered as an alternative, but it is no longer considered as a useful tenhnique. Pipe bending principles are valid for not only round tubes, but also wires, solid bars, oval, square and rectangular profiles. Tecniques described below are pipe bending techniques. While these tecniques are performing, any heating process is not exist neither during nor earlier the bending. In pipe bending techniques, every single bending process needs a set of system. Depending on the pipe diameter and pipe properties an apprepriate bending technique can be ed. And also there are a different bending die for each radius. The bending technique called ram bending or press bending is a common and general method forespecially soft and a large bending radius material. 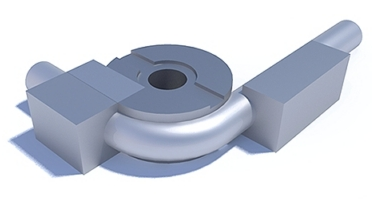 The principle of the technique: Pipe is held from both sides with free clamps (also called opposite dies) and is bended by pushing to main die or radius block. These operations are carried out in large and thick tubes by using special tools and hydraulic press force. Press bending is the oldest techonology for pipe bending. In this technology, force can be obtained using pneumatic, hydraulic or other force units.Furthermore, with the help of horizontal hydraulic presses, the same technique can be used for the bending of profiles, filled bars. In this technique,there is no system to control length between two twist. So, it is impossible to find sensitive measure between two nip. This technique is regarded useful to work with soft material, such as copper and aluminum, especially. -On standard and ongoing bendings, the degrees can not be the same. -Typically used for soft materials such as copper. -Only used for making single-twisted jobs. -İnternal and external deformations of the twists is clearly evident. With manual or hydraulic systems , three roller bending technology is one of the most common bending system in the industry.Pipes, profiles, flats, angles, shaped profiles, solid materials are mainly used for bending material in this area. This technology is an excellent method for large radii. Also, it is the only method of forming to large diameter pipes, such as 300, 400, 500 mm Ø, without further heating. This means that, this technique can be used for pipes from small to large size such as steel structures or pipelines. The principle of the technique:Pipe is inserted between the rollers.Two rollers are held bottom while one is on top.The radius is created by the movement of the upper roller on the vertical direction as up and down.When the upper roller moves below, it approaches two fixed rollers and as a result radius narrows.On the contrary, the upward movement in the vertical direction will ensure radius expands. Some of the cylinders or all of them are provoked to allow the pipes pass from the cylinders. Therefore, in this method, except for the force used to position the rollers there isn’t any additional twisting force. The bending radius depends on the machine possibilities, cylinder dimensions and position, but the twist is often on a large scale. Three roller bending is a highly effective method for large radii applications and is widely used today.In process the fourth roller may be added, but general bending principle is the same. Normally, manual or hydraulic systems are used very widely. However, it is difficult to control the feeding to the tube, so CNC systems are used for more sensitive twists. It is a very common bending technique in the continuityoperations. This system based on the history of the 1800s, compared to the other all the way, which is to provide the most precise and controlled bending of today's most popular tube bending system. The principle of the technique:Firstly, the tube is fastened to the front clamp. Than the rear clamp (pressure die) connects to the tube. Tube is twisted by the rotation of the bending mold. The rear clamp (pressure die) follows to the pipe by applying pressure to it and saves the external shape of the pipe. One of the most important part in the pipe bending process is the mandrel which is inside the tube during bending. Twisting technique is used to give the name emphasizes its importance. Another complementary process is wiper die. It prevents the wrinkles in the inner radius those may occur during the bending. The wiper die is not necessary to each bending operation. However, it is necessary for many cases and also it is indispensable to the solution. 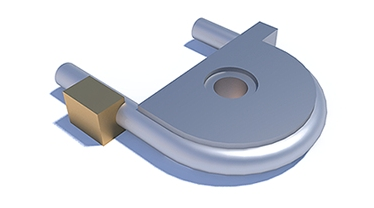 In bending technique by wrapping the die, the pipe is wrapped around the fixed die. To perform this wrapping action, the free pressure die applies reverse pressure to the pipe and it receives die’s form. Today, this technique is often used in bending machine. In these machines, there is no mandrel. According to the operation, the absence of the mandrel may also be an advantage in terms of pipe length. This technique usually is suitable for for pipes has sufficient wall thickness and 3D or greater bending radius. 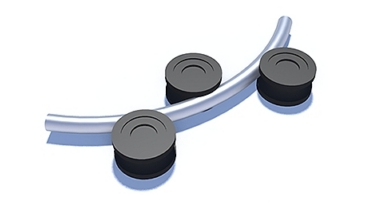 Compression bending is very economical solution if quality is satisfactory. - The system can provide practical solutions to be easily portable. Information provided above was about the only pipes made of cold bending techniques. However, although less commonly used,the bending method by heating during bending (induction) is also available. 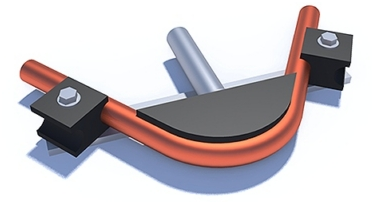 In this technique, pipe is bent without mandrel and bent portion is heated with the induction system during bending. Thus the tubular shape is protected as much as possible and it is possible to bend with narrower radius. However, the length of process time is a serious drawback. This method is generally used to bend to pipes with large size and wall thickness of 5 mm, such as gas or oil pipelines. In addition these, there is a system having a much higher bending technology. It was developed and patented by Japanese. In this system, it is possible to adjust the bending direction and to give shape to the pipe at different radii relative to the movement of the machine head position. This technology is quite unique and different.